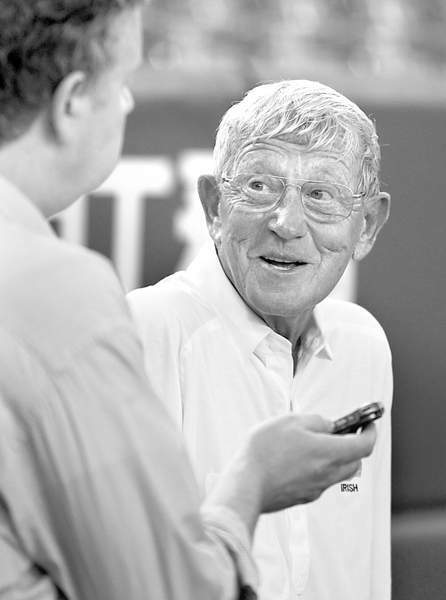 Lou Holtz was football coach at the University of Notre Dame 1986 to 1996. He is a Florida resident. I was always taught that life is a matter of choices. Whatever happens to us in life is going to be because of choices we make. Your success and your happiness will be determined by this and this alone. Hoosiers will make a choice this fall to determine the country's future and certainly the future of Hoosiers. Because I still feel like a Hoosier at heart, I feel compelled to write about my strong support for Mike Braun for the U.S. Senate. I've always looked at people and evaluated them on three basic principles. The first is trust. I feel that you can trust Mike completely. So many times, politicians will say one thing to get elected, then they go to Washington and they act completely differently. Nothing is more obvious than Democrats who will say what the voters want to hear and then do exactly what Chuck Schumer or Nancy Pelosi tell them to do. This can be pointed out in a hundred different ways. I trust Mike Braun to go to Washington and represent what is in the best interest of the people of Indiana and continue being guided by the philosophies that have been so successful for him as a state senator. The second thing I look at is Mike Braun's commitment to excellence. Does he know how to enjoy success? All you have to do is look at Mike's background as a very successful student at Wabash College, where he served as the president of the student body. He married his high school sweetheart 40 years ago and they are still together, sharing four beautiful children. He also has been a very, very successful businessman. Mike is an individual who knows how to win and that you do this by helping other people get what they want. Zig Ziglar said this many years ago, and it's true to this day. The last thing I consider is whether he cares about people, or is he in this for his own personal growth? Having known Mike, I believe he is a very caring individual and very sympathetic to everyone, regardless of their race, color, creed or bank account. I could go on and on about Mike, but suffice it to say that he could write his own recommendation and I would be happy to sign it. That's how much I support Mike Braun. He's a great man and the right guy to represent Indiana in the U.S. Senate.